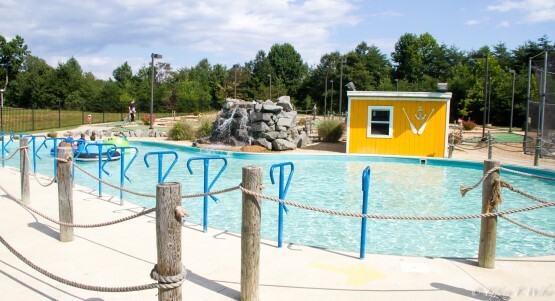 The weather has been so beautiful lately that I’ve wanted to be outside, so I took my girls to the Calvert Play Park in Prince Frederick. Did you even know that we had a mini-golf course in Calvert County? Its completely hidden from view from Route 4, but its only a block down Sherry Lane. With new owners and a new name, you may know this place as R & J’s. It hasn’t changed a lot, but the staff are friendly and its an easy outing with the kids or for an impromptu date night (we saw as many couples there as families). We played mini-golf today which took about an hour. The course is great for all ages with holes that are challenging, but not so impossible as to frustrate younger kids. Our scores ranged from a hole-in-one to ten. Children will enjoy the bumper boats that squirt water, especially on a hot day. My girls got into a huge water fight the last time they went and loved it. The bumper boats have room for 2 riders and are rented for 7-minute intervals which is enough time for the tiny pond. Next to the golf course are the batting cages for softball and baseball which operate on tokens or can be rented by the hour. The Calvert Play Park offers military discounts on golf and batting cages, so bring your ID if you have one. They sell drinks and small snacks, so you can bring the family, and relax a while. Its small, but on a nice day, its a fun place to go.